The crustaceans are a subphylum in the phylum arthropoda. 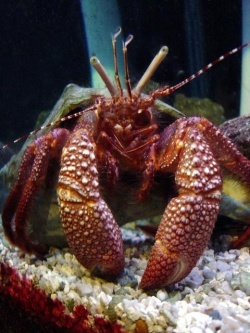 Lobsters, crabs, shrimp and barnacles are some examples of crustaceans. Most of them live in a marine or a freshwater environment, with a few terrestrial members such as woodlice. Carcinology is the scientific study of crustaceans. It is also called malacostracology, crustaceology, and crustalogy. The three distinct body parts that form a crustacean are the head, the thorax, and the abdomen (or pleon). The head and the thorax together are called the cephalothorax. Crustaceans have two pairs of antennae located on the head, compound eyes, three pairs of mouthparts and a telson. Their respiration depends on their size. Smaller crustaceans respire through their body surface by diffusion. Larger crustaceans respire with gills. They both typically have a thick caraspace on their dorsal side of their body. Their appendages and the second pair of antennae are typically biramous. Most crustaceans have separate sexes and are distinguished by appendages on the abdomen called pleopods or technically, swimmerets. The male’s first pair of pleopods are larger than those of the female. Terrestrial crabs like a Christmas Island Red Crab mate seasonally and return to the sea for the purpose of releasing the eggs. In many decapods, the eggs are retained by the females until they hatch into free-swimming larvae. Although crustaceans are more rare to finds as fossils than trilobites, many types of crustaceans are common in the rocks of the Cretaceous period and the Cenozoic era. Most of the smaller crustaceans like shrimp have an exoskeleton, which is somewhat delicate. Therefore their fossil record is comparatively poor. Other crustaceans, such as crab and lobster have a thicker exoskeleton, which is reinforced with calcium carbonate. Because of that, their fossil record is much fuller. The fossil record of barnacles is so rare that little is known of their history prior to the Mesozoic era. Only a few well-preserved specimens are found in the rocks of the Cretaceous period and the Cenozoic era. The most well-known crustacean is the Malacostraca. It includes crabs, lobsters, crayfish, and shrimp. They are globally spread today, but only found sporadically as fossils. Most of the known fossil crabs live on the sea-floor or in a reef environment. It is possible to find fossil crabs in the rocks such as the Gault clay from the Cretaceous period and the London clay from the Eocene period in England. Many well-preserved examples of the small glypheoid lobster Mecochirus magna are found in the “Lobster Bed” of the Greensand formation from the Cretaceous period, which occurs at Atherfield on the Isle of Wight in England. Because of many exceptionally well-preserved crab, lobster and shrimp fossils, the lithographic limestones from the Jurassic period of Solnhofen in Germany is very well-known famous. This page was last modified on 26 August 2015, at 16:45.